Reports of gold deposits near present day Nome, Alaska go back as far as 1865, but it was the rich discovery on Anvil Creek in the summer of 1898 that really got people excited. Jafet Lindberg, Erik Lindblom, and John Brynteson were three prospectors of Swedish descent who became known as the “Three Lucky Swedes”. Word of their discovery reached the goldfields of the Klondike region that winter, and by 1899 thousands of men poured into what was then called Anvil City. Not long after their initial discovery on Anvil Creek, gold was discovered on the beach sands along the Bering Sea and the gold rush was really on. As the sea ice receded in the spring of 1900, steamships from Seattle and San Francisco brought thousands into this remote Alaskan community in search of gold. It was estimated that there were as many as 20,000 people living in Nome during its heyday, with nearly one third of all white men in Alaska living in Nome. Early gold recovered within the Nome Mining District was almost entirely by placer operations. Gold was found throughout the beach sands for many miles. 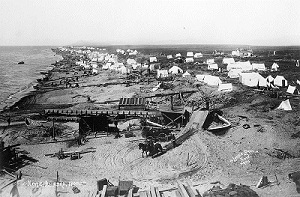 Tent cities sprang up along the beaches with miners scattered up and down the beaches near Nome. Miners used pans, rockers, and sluices to recover the fine gold from the beach sands, and later makeshift operations included hoses and pumps to help increase production. Claim jumping became a real problem, with many latecomers to the Nome gold rush claiming over top of the existing claims. Crooked politicians and judges allowed some of the claim jumping to continue for their own personal gain, but the process was eventually stopped by the Federal Ninth Circuit Court of Appeals. Miners continued pouring into Nome from the Klondike as well as throughout the world. Active beach mining continued for the first several years of the 20th century. Large mining companies set up bucket line dredges and hydraulic operations throughout the district. New gold deposits were found above the high tide a few years after the initial beach discoveries, but these deposits were quickly exhausted. The 1909 census showed a population of only 2,600 people, down from the estimated 20,000 people that were present during the peak of the rush a decade earlier. 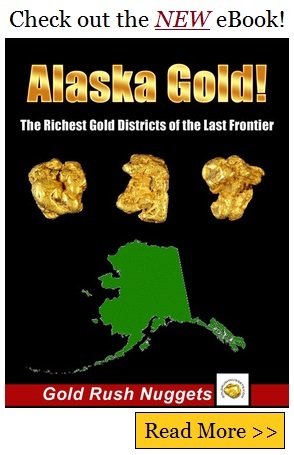 Miners slowly left the area in search of new gold strikes throughout Alaska and other parts of the US. Due to several fires and violent storms, very few of the original structures from the early gold rush to Nome still stand today. Nome remains an extremely isolated town with no roads into the city, all access requiring boats or airplanes. Over much of the past few decades, much of Nome’s economy has been dependent on tourism rather than gold mining. However, with the recent increase in gold prices, and technological advances with large suction dredge operations, Nome is once again a bustling mining community. During its short mining season each summer, gold seekers still converge on the small community to try and strike it rich mining for gold.